Note: Levels are two hours in length. There will be a 90-minute dinner break after level 8. 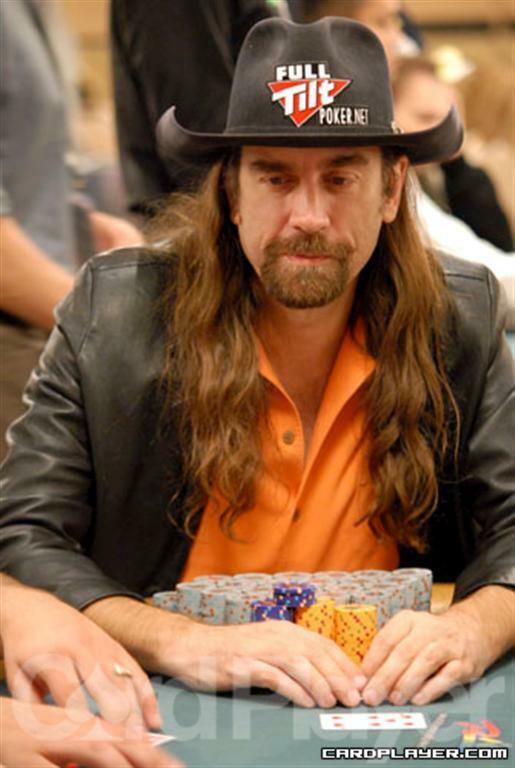 Phil Gordon raised to 1,500 from late position and was called by the player in the big blind. The flop came down K 10 7 and the big blind checked. Gordon continued with a bet of 2,500 and the big blind raised. Gordon reraised and his opponent moved all in. Gordon called and showed K Q for top pair. His opponent showed 9 6 for a straight flush draw, but it bricked out on the turn and river which fell A 2 . Gordon scored the knockout and now has 90,000 in chips. Joe Cada raised to 1,200 from late position and was called by the small blind. The flop fell 4 4 2 and both players checked. The turn was the 3 and the small blind bet 2,500. Cada called and the river was the J . The small blind fired in 4,200 and Cada called once again, showing down A 9 for ace high. Cada’s opponent could only turn over K Q and Cada took the pot, boosting his stack to 54,000 in chips. Day 1C chip leader Kevin Song raised to 1,700 from under the gun and got reraised by the button to 3,000. Song called and then called another bet of 3,000 on a flop of 9 5 3 . The turn was the 9 and Song called another bet of 5,000. The river was the 8d and Song checked once again. His opponent tossed out 5,000 and Song called with pocket jacks. The other player showed down K Q for king high and Song took the pot to increase his stack to 180,000. Boston Celtics star Paul Pierce had a great day 1, but his day 2 isn’t going as smoothly. Pierce recently paid off a bet holding As 6s on a board of A 8 2 6 10 , only to see his opponent turn over Q 7 for a flush. Pierce now has 51,000 in chips. Pretty good, but nowhere near where he once was. On a flop of Q J 2 , Tom Marchese check-raised all in holding K 6 and was called by Phil Gordon and his Q 2 . The turn and river fell 4 Q and the 2010 Card Player Player of the Year was eliminated. Gordon will now face off against Greg Raymer. Phil Gordon was all in holding A 4 , but he was dominated by the A Q of Erik Seidel. The board came down Q 10 9 8 4 and Gordon was eliminated. Seidel, who is having one hell of a year, moves on to face Vanessa Selbst in the Elite Eight. 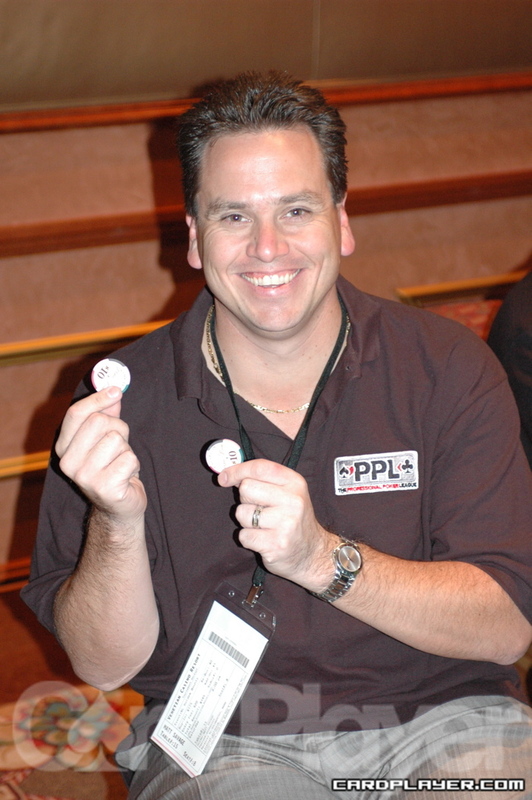 Phil Gordon built up a small lead when he and Greg Raymer got the rest of their chips in the middle. Raymer held pocket queens, but he was racing for his tournament life against Gordon’s big slick. The board brought a king and Raymer was eliminated. Gordon will now take on the winner of the match between Jennifer Harman and Erik Seidel. Robbie Verspui opend to 2,000 and Eric Froehlich called. The flop came A 9 3 and Froehlich got the rest of his short stack into the middle. Verspui called with the A 3 and was in great shape against the A-5 of Froehlich. The turn and river bricked for Froehlich and he was gone. On a board of A 9 2 2 7 , Sorel Mizzi put James Dempsey all in. Dempsey tanked before eventually making the call. Mizzi tabled the A 9 , while Dempsey mucked. On a board of 8-8-5-A-2, Benjamin Sulsky bet 20,000 into Phil Gordon on the button. With a large pot laying on the felt, Gordon tanked before finally calling with the K 10 for just king-high. Benjamin tabled the 9 2 and threw his hand into the muck, thinking that he lost when his bluff was called, and saying “nice hand” to Gordon. Gordon also thought his K-10 was the best hand and started raking in the chips. The dealer then informed both players that Sulsky had riverd a pair of deuces and that Gordon’s king-high was not the best hand. Both Sulsky and Gordon were surprised, especially Gordon who was in awe about the situation. Ramdin was short on chips and moved all in preflop with the 7 6 and was called by the Q 4 of Phil Ivey. Ivey flopped a queen and Ramdin failed to catch anything. Gregory Brooks moved all in for his last 2,000 with the A J and Phil Gordon made the call with pocket deuces. The pair held and Gordon advanced. Cajelais was all in on a flop of 7 4 3 with the 8 7 . However, his opponent had him dominated with the 9 7 . The turn and river bricked for Cajelais and he was gone. Annette Obrestad’s opponent was down to 11,000 and was all in with A-5 versus the A-6 of Obrestad. The board ran out safe for the 21-year-old and she advanced. Johannes Strassmann was all in with the 5 5 versus the A Q of Vanessa Rousso. Rousso paired her queen on the flop and it held to eliminate Srassmann. Scott Seiver’s A Q failed to outrun the 7 7 of Brian Rast. The board ran out J 8 4 5 5 and Seiver was gone. Alexander Venovski’s A-10 won a coin flip against the pocket fours of Joe Cada. Cada continues to have an unsuccessful series. Phil Gordon built a slight lead of 23,000 to 17,000 when the final hand in his match with Tom Dwan (pictured left) went down. The two were all in preflop, with Gordon holding pocket sevens against Dwan’s A Q . The board fell K 10 2 3 4 and Dwan was eliminated. Gordon will now take on the winner of the Phil Laak and John Juanda match. We haven’t seen anybody take their defeats as hard as Phil Gordon (pictured right) just did against Phil Laak. The river was the 10 and the entire audience groaned in disappointment. Gordon flew back in his chair and Laak’s supporters went nuts in the background. Top make matters worse, the production team called Gordon back to the set to relive his brutal beat for host LeAnn Tweeden. Phil Ivey (pictured left) had Scotty Nguyen down to his last few big blinds on several occasions, but Nguyen just kept doubling up. At one point, Nguyen actually held set over set, giving him the chip lead. On the final hand on a board reading Q-9-2-4, Ivey held pocket kings and Nguyen held just J-9 for second pair. Sure enough, the river was a nine and Ivey was eliminated. Nguyen will now face Gabe Kaplan in the Sweet Sixteen. 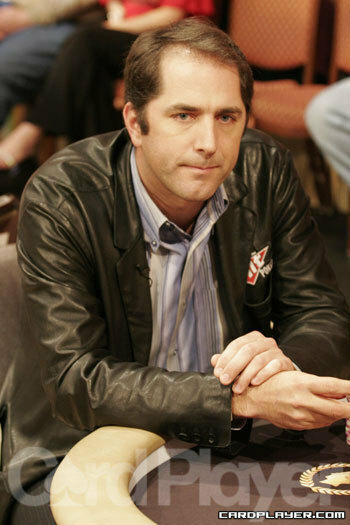 Jamie Rosen, Jason Somerville, Steven Fung, Phil Gordon, and Keith Lehr have all busted out of the tournament. Day 1 has officially come to an end. More than 2,000 people registered for Day 1D and just under 1,400 survived to make it to Day 2. 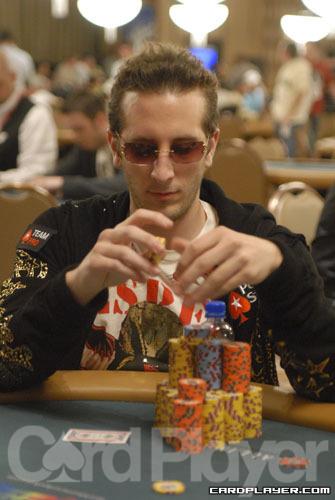 Among the notables moving on were Antonio "The Magician" Esfandiari, David Oppenheim, Phil Hellmuth and Victor Ramdin. The biggest news of the day was the $9,119,517 awarded to the eventual winner of poker's biggest event. The total amount of players was also announced at 6,844, a little over 500 more players than last year. A total of 666 players will make the money. The field will get Monday off, so join Card Player Tuesday at noon for all of the live updates as we keep you posted on Day 2A. Layne Flack raised to 1,350 from early position and he was called by one opponent. The flop came down J 9 8 and Flack checked. His opponent bet half the pot as he put 1,800 in the middle. Flack then pushed all in and his opponent quickly made the call. Flack showed K J for top pair with second kicker, along with a flush-draw. He needed to sharpen his drawing pencil, however, as Flack's opponent showed Q 10 for a flopped straight. The 4 offered no help and Flack needed a heart to stay alive. The river washed away any hope as the 2 landed on the felt and Flack made his way toward the exit. Carlos Mortensen raised to 1,100 from under the gun. Three players called and the flop came K J 5 . The player in seat 9 checked and Mortensen fired 3,000 into the pot. Everyone folded except for seat 9, who made the call. The turn was the 2 and seat 9 checked again. Mortensen bet 6,000 and seat 9 moved all in for an additional 12,000. Mortensen counted the call in his hand, then kissed them goodbye as he tossed them into the pot. Seat 9 showed 9 8 for a flopped flush and Mortensen briefly flashed K Q and attempted to muck it. But the dealer turned the cards over and put the 2 on the felt to complete the board. Mortensen took the tiny pinch to his stack. Brandon Cantu raised to 1,600 from the button. The blinds both called and the flop came 10 6 4 and action was checked to Cantu. He bet 2,700 and only the big blind stuck around. On the 7 turn, both players checked. When the 9 hit on the river, the big blind fired 4,000 and Cantu thought briefly before announcing he was all in, having the big blind covered. The big blind mucked his hand and Cantu took the pot. Later, Cantu again raised to 1,200 from the button. Gus Hansen was in the small blind this time and made the call, along with the player in the big blind. The flop was A 3 2 was checked around to Cantu, who bet 2,500. Hansen called and the big blind got out of the way. The Q came on the turn and both players checked. When the 5 came on the river, Hansen fired out 6,000 and Cantu insta-called. Hansen turned over A K for top pair. Cantu had a look of disgust on his face as he mucked his hand. Hansen took the pot and was at 74,000. A player raised to 1,500 from the button and Howard Lederer made the call. Both players checked the flop of K 4 5 . The 9 fell on the turn and Lederer led out for 1,500. The button called and both players checked the river, which was the 8 . Lederer showed A 4 for bottom pair and a busted nut flush draw. His opponent showed A 9 for second pair, good enough to take the pot. Lederer was down to 32,000. Antonio Esfandiari and Victor Ramdin, two of today's big stacks, were sitting at adjacent tables. Esfandiari came over to Ramdin and asked if he wanted to bet the flop. Ramdin bet $1,000 that two of the three cards on the flop would be black. Esfandiari clarified the bet, saying the bet would double if the flop was all the same color, triple if the flop was all the same suit, and multiply by 10 if a three-card straight flush hit the board. "Fine, I'll take red," Esfandiari proclaimed after the clarification. The flop came down J 8 5 and Ramdin won the prop bet. "Man, nothing ever goes right in my life," Esfandiari said. "I'm gonna stiff you, punk," he added as he walked back to his table. "Double or nothing on the next flop?" Ramdin asked. "Okay," Esfandiari responded. 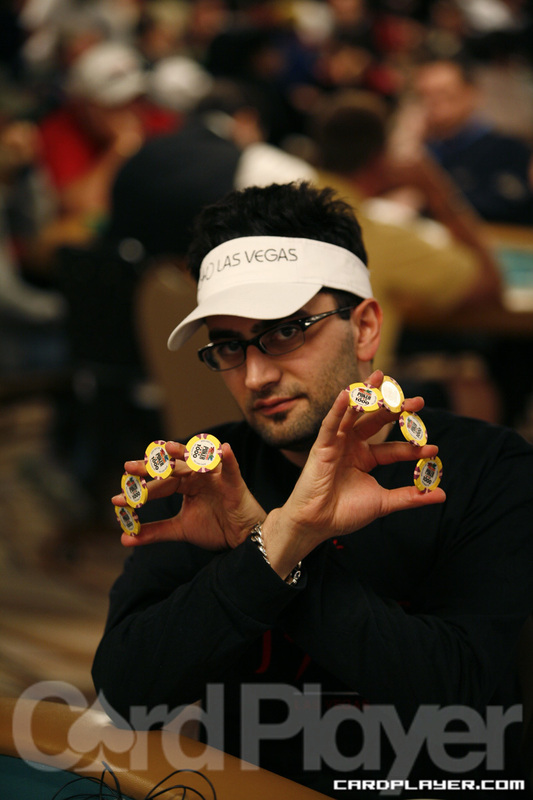 Read more about Esfandiari's prop betting in his Pro Analysis. With four limpers in front of him, the player in the cutoff raised to 2,700 before the flop. Ramdin limp-raised to 5,500 from under the gun. Action folded back to the cutoff who made the call. The flop came down K 6 5 and Ramdin fired 6,000. The cutoff thought for a bit before releasing his hand. After the hand, Ramdin had 122,000 in chips. Ryan Young raised to 1,400 from middle position and the player in seat 7 repopped to 6,350. Phil Gordon then shoved all in and Young got out of the way. Seat 7 made the call and was covered by Gordon. Gordon turned over A A while seat 7 had K Q . The flop came out 10 8 2 , relatively harmless to Gordon's hand. But the turn brought the J , giving seat 7 an open-ended straight draw. But the river was the 3 and Gordon knocked out seat 7. He improved his stack to 62,000. The player in seat 4 raised to 1,200 from early position and Allen Cunningham made the call from the cutoff. The flop came down 9 6 4 and seat 4 fired 2,600. Cunningham quickly called and the turn was the 10 . Seat 4 slowed down, checking to his opponent. Cunningham kept his foot on the gas and fired 5,000 into the pot. Seat 4 made the call and the river was the 2 . Seat 4 checked and Cunningham took time to think about whether he could get any value out of a final bet. He decided he couldn't and checked as well. Seat 4 showed down J J for an overpair. Cunningham showed an overpair of his own, Q Q , and raked in the pot. He was at 80,000 after the hand. Todd Brunson's tournament came to an end when his 5 6 ran into his opponent's nut flush with A J on the turn of a board reading 6 4 2 6 . 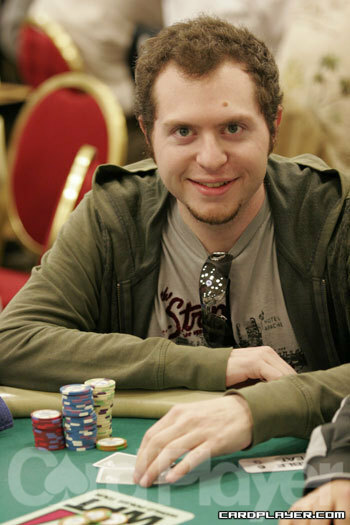 Brunson failed to improve on the river, which brought the A and the end of the Brunson's 2008 WSOP. 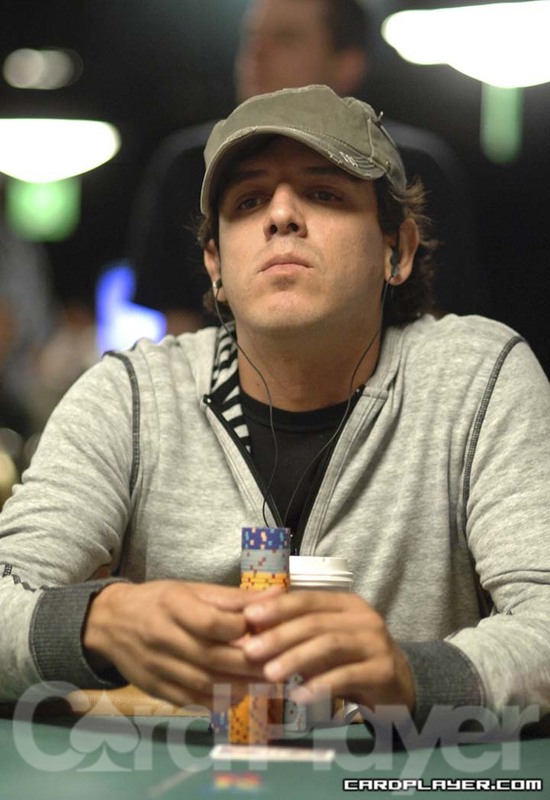 On a board of Q 10 5 4 5 , Carlos Mortensen made a 4,000 bet on the river and the player in seat 3 looked him up. Mortensen rolled his eyes and threw his hand into the muck. Seat 3 raked the pot, but failed to make a significant dent in Mortensen's growing stack. 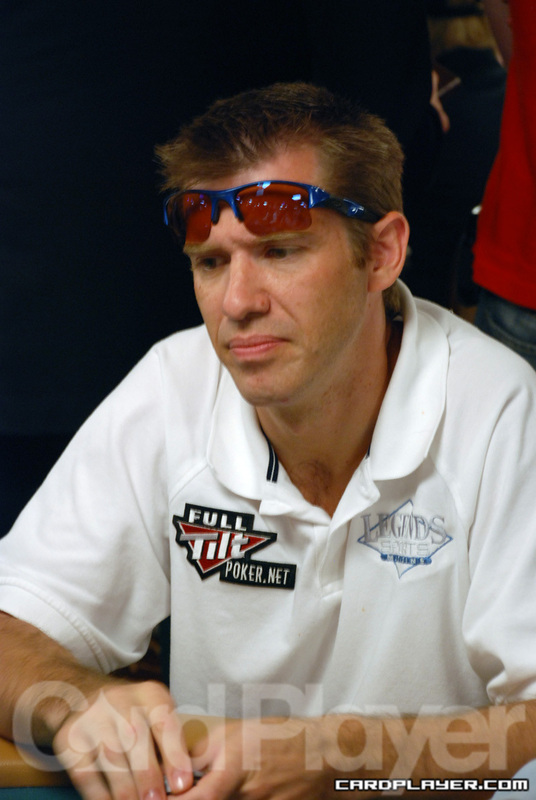 After the hand, Mortensen still had well over 120,000 in chips. Bernard Lee Gets Bluffed Out? Heads-up and on a board of 10 9 3 K 5 , Bernard Lee bet 7,700 on the river. His opponent in seat 7 thought for a minute before asking Lee how much he had left. Lee did a quick count replying, "A little under 11,000." Seat 7 moved all in and a short stacked Lee folded the hand after a minute or so in the tank. Seat 7 showed 8 8 as he raked the pot, Lee looked a little thrown off. Seat 7 said, "I wouldn't have done that, but you checked the king on the turn, so I knew you didn't have it." 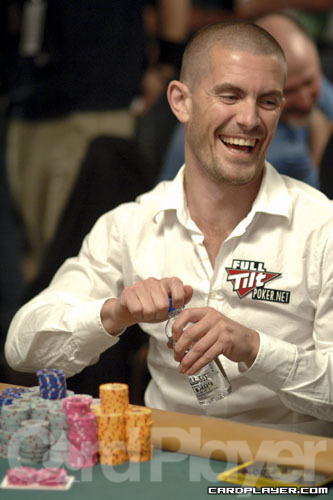 Lee shook his head and shrugged it off, down to 11,000 in chips. Gordon raised preflop to 1,025 from middle position and the player in seat 2 called from the cutoff. The flop came down Q Q J and Gordon checked. Seat 2 fired 1,000 and Gordon quickly called. The turn was the 3 and Gordon checked again. Seat 2 fired 2,500 into the pot this time and Gordon quickly called again. The river was the 8 and Gordon checked one more time. Seat 2 fired 5,000 into the 9,050 pot. Gordon quickly called and seat 2 showed down K Q and Gordon shot out of his chair, a disgusted groan coming out of him. He took a short walk away from the table as his hand was placed in the muck. He was down to 35,000 in chips. The player in seat 1 moved all in before the flop and Matt Savage made the call. Savage had him covered and both players turned over their cards. Matt Savage was way behind before the flop, his opponent making top pair on the flop and all but reducing Savage to going runner-runner. The 8 on the turn gave savage the open-ended straight draw, and the 4 on the river locked it up. Savage sucked out to make the eight-high straight, eliminating his opponent and bringing his stack up to 45,000 after the hand. The player in seat 7 raised to 1,200 from the cutoff and Men "The Master" Nguyen reraised to 4,000 from the big blind. Seat 7 called and the flop came 7 6 5 . Nguyen fired out 6,000 and seat 7 made the call. The turn was a scare card (2 ) and both players checked around. The river was another scare card (8 ), and Nguyen went into the tank for nearly three minutes on his own action. Finally Nguyen checked to to his opponent who rapped the table as well. Seat 7 said, "How big is your pair?" as he turned over A 5 for a pair of fives. Nguyen said, "Fives are good man" as he threw his cards into the muck. Nguyen lost more than half of his stack that hand, now down to just 9,000 in chips. Ramdin Pushed Out, So What? Victor Ramdin raised to 1,200 from middle position and the player in seat 8 made the call from the small blind. The flop came down 10 4 3 . Ramdin continued with the aggression as he fired 2,000 into the pot. The small blind had enough of that nonsense, however, and he came over the top with 3,000 more. 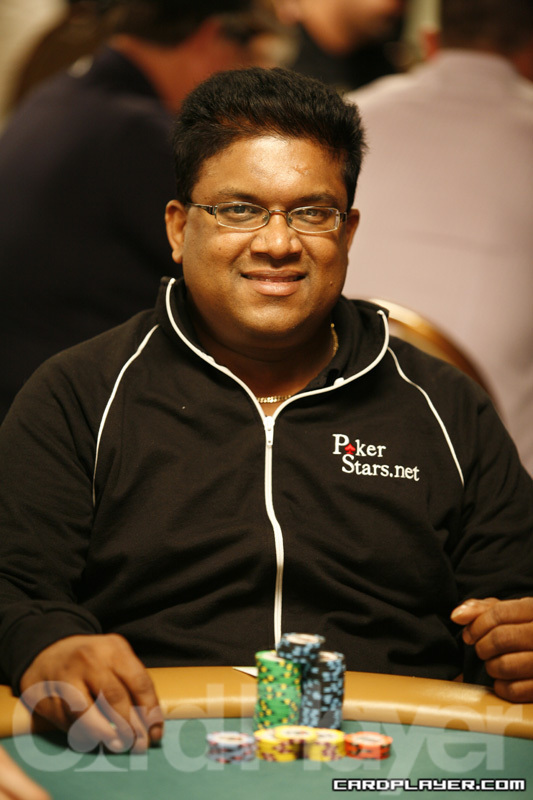 Ramdin mucked his hand, but was still left with a healthy 93,000 in chips. The player in seat 6 raised to 2,400 from middle position and action folded to Antonio Esfaniari on the button. "How much do you have left," Esfandiari asked his opponent. After getting his answer (approx. 24,000), Esfandiari made the call and the flop came down 10 8 4 . Seat 6 checked and Esfandiari applied the pressure with a bet of 4,600. Seat 6 liked the 24,000 he had left and decided not to put any more of it at risk as he mucked his hand. Esfandiari took the pot and was around 88,000 after the hand. Dario Minieri raised against one middle position limper to 1,600 from the small blind. The limper called, and also called Dario's bet of 2,300 on the flop of 7 2 2 . The turn was the 10 , and the Italian Harry Potter shoved for his remaining 7,500. His opponent called once again, and was in bad shape holding A 10 against Minieri's Q Q . But the river brought an unfortunate 10 , sending the bracelet winner to the rail early in the last level of the night. "Come on, boys. Let's play a pot." Phil Hellmuth said as he limped into the pot. 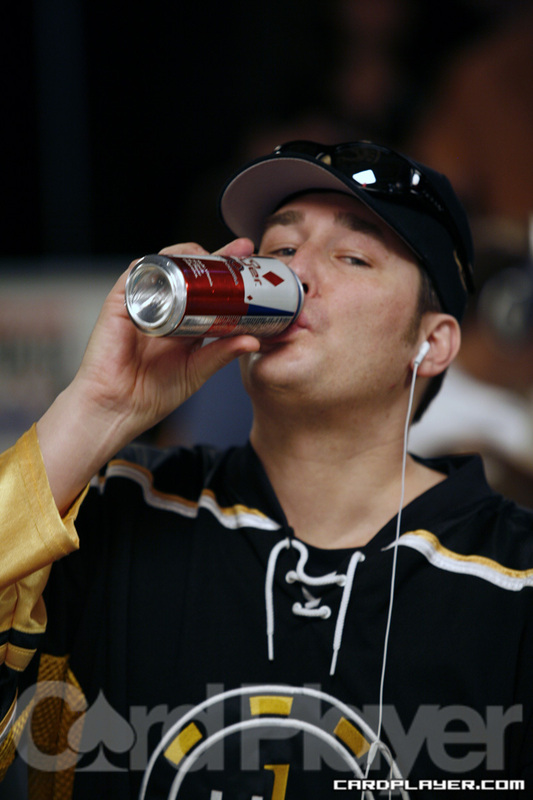 The button reached to put in a raise and Hellmuth told him, "I'll call you." True to his word, the button raised to 5,000 and only Hellmuth called. The flop came 9 7 4 and Hellmuth checked. He then told the button player, "I'll call you on the flop. You can bluff me on the turn." The button bet 10,000 and Hellmuth made the call and checked dark, all the while still talking and saying things like, "Your turn to bluff me." The 5 fell on the turn and while Hellmuth kept talking the button checked as well. Before the river was dealt, Hellmuth called out for a "deuce!" He got his wish, and the 2 hit the felt on the river. Hellmuth got quiet and put in a smalll bet of 5,000. Then the talking started back up. "You got me. Pop it up a little! You can value bet anything!" The button reached for his chips as if he was going to listen, then mucked his hand and accepted his defeat. "It's a pair of 3s," Hellmuth said as he showed his hand - 3 3 . His opponent said the threes beat him. "I had him beat," Hellmuth added. "Fair and square." With the hand finally over, his opponent started talking, saying things like, "You're just a donkey," "You misread your hand?" "10,000 with threes? Is that in your book?" Of course Hellmuth had an answer. "That's not in the book. You can't even describe that play." Later, the player in seat 5 raised to 3,000 from the cutoff and action folded to Hellmuth in the big blind. He grabbed a huge stack of orange "5,000" chips, putting his opponent all in. Seat 5 made the call and showed down A 10 . Hellmuth showed A K and was in great position to knock his opponent out. The flop changed that as it ran out Q Q 10 . Surprisingly, Hellmuth showed no reaction. Maybe it was because he knew the K would hit on the turn, as it did. The river was the A and Hellmuth knocked out another pretender. He was up to 195,000 after the hand. On a flop of Q 10 2 , Carlos Mortensen got it all in with 2 2 against Grant Hillman's Q Q . Both players flop a set as Mortensen is reduced to either catching the case deuce or going runner-runner heart flush. The turn and river failed to bring any help for Mortensen who was eliminated late here in Day 2b. On a flop of 8 5 4 , the player in seat 5 bet 2,000 and Phil Gordon made the call. The turn was the 3 and this time seat 5 bet 5,000, Gordon called. The river was the 8 and seat 5 fired 8,000 in the middle, Gordon made the call. Seat 5 turned over A 3 for the ace-high flush and Gordon mucked his cards. After this hand, Gordon dropped down to 150,00 in chips. On the turn of a board showing Q 5 3 3 , John D'Agostino was heads up against one opponent, who led out for 3,500. D'Agostino raised to 9,500, and his opponent made the call. The river was an interesting card, the 3 . Again, D'Agostino's opponent led out for 3,500. D'Agostino thought for only a short time before raising to 20,000 total. His opponent eventually made the call, but was forced to muck his hand after D'Agostino turned over 5 5 and raked in the substantial pot. To read more about John D'Agostino's thought process on this hand, be sure to check out his Pro Analysis blog. 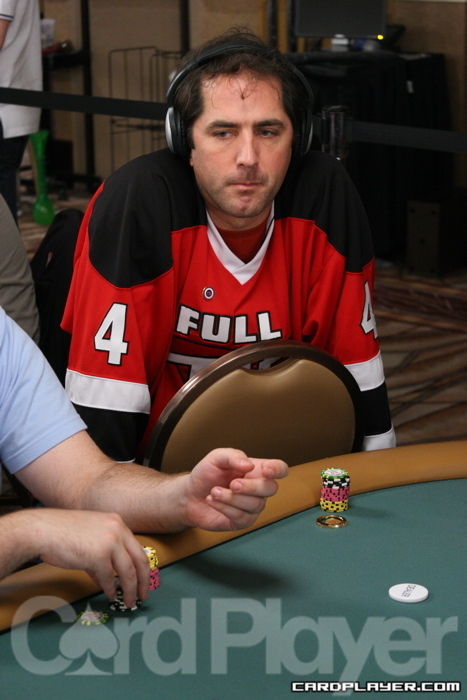 The player in seat 8 raised to 3,000 from middle position and David Oppenheim called his remaining 1,300 into the pot. The big blind also jumped in and the flop came J 8 2 . The big blind fired 10,000 and seat 8 was forced to muck. "Did you bluff him?" Oppenheim wishfully asked the big blind. He got his answer when the player turned over J 3 . Oppenheim showed A Q . He needed to hit something on the turn or river to stay alive. The turn was the 5 and the river was the 2 and Oppenheim took his leave from the 2008 main event. 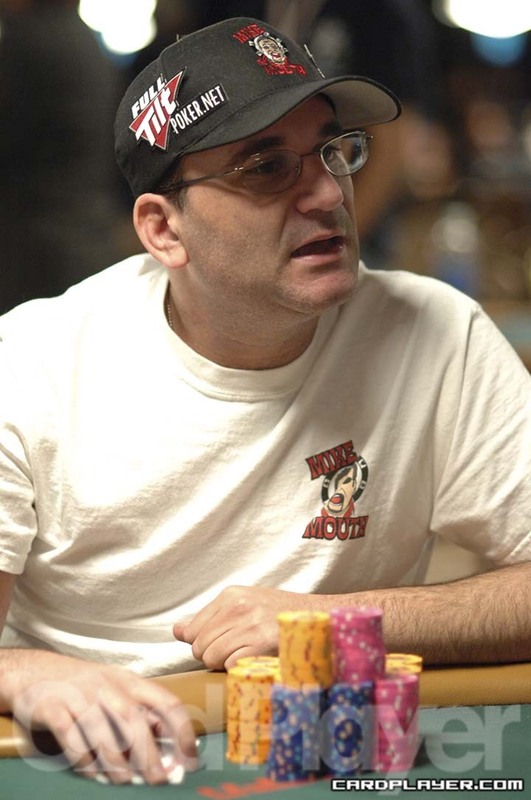 With about 7,000 already in the pot, Mike Matusow checked a flop of A 3 6 . The player in seat 8 fired 4,000 and Matusow quickly called. The turn brought the 10 and Matusow checked again. Seat 8 kept up the pressure, firing 8,000. Matusow turned over 8 8 and then threw them into the muck. The player to Matusow's left said something to "The Mouth," and he replied with, "I'll get him soon." He was at 60,000 in chips. The player in seat 7 raised to 3,000 from middle position and the player in seat 1 called from the button. Bertrand "ElKy" Grospellier was next to act from the small blind and he made it 10,700 to go. Seat 7 mucked and seat 1 made the call. The flop came down 8 6 6 and Grospellier fired 12,600 into the pot. Seat 1 made the call and the 8 came on the turn. Grospellier fired 18,500 this time, forcing seat 1 to muck his hand after many moments of thinking. Grospellier then turned over the 2 and seat 1 simply shook his head as the huge pot was sent Grospellier's way. He was up to 110,000. The player in seat 6 raised to 3,200, only to have Jeff Madsen re-raise to 10,000 from the button. Action folded to seat 6 who stared at Madsen. After a brief pause, seat 6 mucked and said he had queens. Madsen teased like he was going to show his monster hand, then changed his mind. But when seat 6 begged for him to show, Madsen slammed down 7 2 , causing his opponent to smile and asked simply, "Why?" Madsen sits with around 150,000. On a flop of K 9 7 , Liz Lieu checked and the player in seat 8 bet 8,000. Liu raised (check-raise) all in for 20,000. Seat 8 tanked for a minute before making the call. Both players turned over their cards. Lieu got it in with top pair against ace-high, and the turn and river brought the 3 and the 4 . Lieu's kings held up as she doubled up to just about 50,000 after the hand. On a board of J 6 2 3 , Bernard Lee bet 9,600 and the player in seat 9 raised to 30,000. Lee came over the top and moved all in for 70,000, seat 9 made the call. Lee turned over 5 2 for the flush, but seat 9 showed A 7 for the ace-high flush. Lee wasn't quite drawing dead on the turn, he would need to catch the 4 on the river to make the straight flush and double through his opponent. 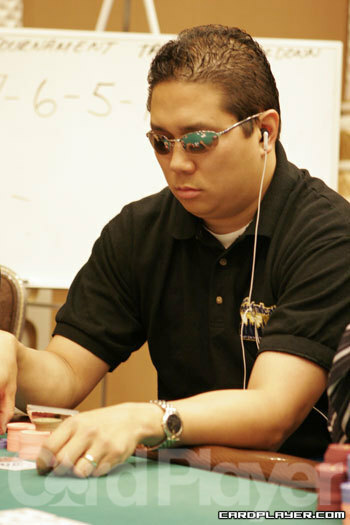 The river brought the 10 , and Bernard Lee was eliminated from the main event. On the flop of a board reading 6 4 3 , action checked around to Phil Gordon in the cutoff, who made a large bet of 15,000. The player in the small blind thought for some time before moving all in. Gordon quickly pushed in a call, showing 4 4 and crushing his opponent's 3 3 . The turn was the J , leading Gordon to call for another spade for the chop. The river instead brought the 5 , sending the pot across the felt to Gordon and sending the player in the small blind home. Gordon was up over 165,000 after the hand. A few hands later, Gordon lost a few of those chips when he and fellow pro John D'Agostino both called a short stacked player's raise all-in before the flop. D'Agostino and Gordon both checked down the entire board, which ran out Q J 10 2 2 . The short stacked player, sitting in seat 6, flipped over A K for the flopped nut straight. D'Agostino and Gordon both mucked their cards. Even after the triple up, seat 6 sat behind only around 7,000 in chips. The player in seat 8 raised to 3,300 from late position and action folded to Thomas "Thunder" Keller in the big blind. Keller asked his opponent what he had left (33,200). Keller then raised to 12,000 and seat 8 immediately moved all in for 21,200 more. Keller thought for a couple of seconds before making the call and turning over A Q . Seat 8 rolled over Q Q , dominating Keller's hand. The flop brought the case queen as it fell Q 8 4 . Keller needed running aces to win the pot. But the turn brought the J , leaving Keller drawing dead. The A was an added kick to the groin, giving Keller a worthless two pair. Keller was down to 121,000 after the hand. Steve "MrSmokey1" Billirakis limped under the gun along with 3 others and the flop came 10 8 7 . Action was checked to Billirakis who bet 3,500. Seat 7 then check-raised to 10,000. Billirakis had his opponent covered and eyed seat 7's chips. He eventually announced he was all in, putting his opponent to the ultimate test. The pressure definitely made seat 7 uncomfortable, as he adjusted in his seat and sighed while thinking what to do. After some deliberation, he said he called and Billirakis showed 9 2 for the open-ended straight draw and flush draw. Seat 7 slammed down 8 8 happily and pumped his fist. The turn brought the 10 , sending seat 7 into a celebration-mode because he made a full house, leaving Billirakis drawing dead. The river was a meaningless 2 and Billirakis lost nearly 100,000 in the hand, dropping to around 115,000. Talk about a fun table. Teddy "Iceman" Monroe has just joined the table already featuring Bryan Micon, who announced, "It' the Iceman!" as Monroe took his seat. Bryan Micon raised to 2,500 from late position and was called by the player in seat 2, who was in the big blind. On a flop of K Q 2 , the big blind checked to Micon, who fired out 2,300. Seat 2 thought it over and stared at Micon. Micon smiled back and the big blind cracked a smile as well. He eventually called and when the 7 hit on the turn the big blind instantly moved all in for 7,800 more. "So sick," Micon said. "I know exactly what you have." Micon mucked his cards and told his opponent that he had a pair. His opponent said he could beat that. After grabbing a stack of chips Jean-Robert Bellande eye-balled the under the gun player who had just limped into the pot. Bellande elected to just limp in as well, and when the flop came out there were 6 players who had done so. The flop came Q 10 6 and the player in the big blind led out for 2,300. Action folded to Bellande who announced a raise and made it 10,000 more to go. Action folded around back to seat 3 who thought briefly before mucking. Bellande said that he had a hand this time. "I was going all in," he said. "I had middle pair with the flush draw and I was ready." Jun 29, '08 2008 39th Annual World Series of Poker Event 51 - H.O.R.S.E. Alex Jacob and a short-stacked opponent went to fourth street with a K and 10 showing respectively. On fourth street, Jacob bet and his opponent called, leaving himself only 525 behind. Jacob bet again on 6th street and the other player contemplated for a while, picked up his final few chips and said, “What am I going to do with these anyway?” He tossed them in for the call, but would regret it almost immediately. After 7th street was dealt, Jacob showed (A )(Q )(J ) for the straight. The pot gives Jacob 5,200 early on day 1. Ferguson’s opponent said, “Well, I started out okay,” as he flipped over his cards. His river card was the 7 and he was eliminated mid-way through level 3. This pot, though not particularly large, was important for Ferguson as it represented a sizeable portion of his stack. He now sits with 2,600 in chips. A player completed to 100 and Andy Bloch raised to 200. The player called and each player was dealt a fourth card. Bloch bet out and his opponent called. The hand switched gears when the opposing player was given a pair of open queens. As a result, he bet out on the final three streets, getting called all the way down by Bloch. Bloch’s showed his set when he flipped over his Q and that was good enough to win the pot. Bloch’s stack took a bit of a hit and now he has 3,000.